Linda is the Marketing and Sales Executive for Exceptional Villas and has an in-depth knowledge of the travel industry. Linda's qualifications are in the area of business, marketing and tourism. 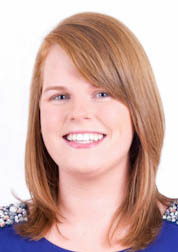 Her qualifications include a Masters in Marketing from NUI Galway as well as a Bachelor of Commerce Degree and a Post Graduate Diploma in Marketing Practice. Linda has worked for over 12 years in the tourism sector and brings a great level of customer service from her hospitality background. Linda travels for much of the year inspecting all of our luxury villas; the majority of her time is spent in the Caribbean and Europe. As Marketing and Sales Executive, Linda is responsible for having a deep understanding of each luxury destination and for personally inspecting each of our villas before recommending them to our guests. Linda is also head of the sales team as well as looking after all aspects of our social media. "Our focus at Exceptional Villas is to understand the requirements of each guest and match those requirements with the prefect villa in the perfect destination. We see ourselves as the experts when it comes to recommending villas to our clients and we offer first class concierge service to each client." "I have literally been to each destination we feature and I must say it is very hard to pick a favourite. If you prefer to be with a group of friends and want to spend a lot of time at the villa with staff included then Jamaica is top of the list. Another favourite place of mine is Barbados where you can find amazing beaches, villas and the best fine dining restaurants. If you want something totally private and relaxing with days spent on the beach than Anguilla is a great choice and my ultimate favourite place is Jumby Bay Resort in Antigua. Our feet are firmly on British soil having had a very special holiday at Westhaven with our friends, our children, and our grandchildren. It is true to say that without the huge backup we received from you both before the holiday and during it many things would have gone wrong and we would have been much less relaxed. Whether booking the car (which was difficult enough),giving us full local information, arranging restaurants etc.etc etc you could not have made it easier for us or more enjoyable. I cannot remember a time when I did not receive a reply to an email or query within a few minutes of sending it and this included New Years Eve when you, Linda, were just off to a party!!! Many replies were at GMT bedtime such that I wondered where you were only to learn it was Ireland!! The same applied to you. Julie, and I don’t think you missed a trick! Interestingly, your very quick response landed the booking in the first place because my original enquiry went to three agents and you were by far the quickest off the mark. You are an excellent team and I could not have wanted for more. Thank you both. Your help and efficiency extended to viewing villas for next year. Undoubtedly we will return and we have a list of the villas we would like to take to take. Again, because of your enthusiasm and help we will rent through you and only you.